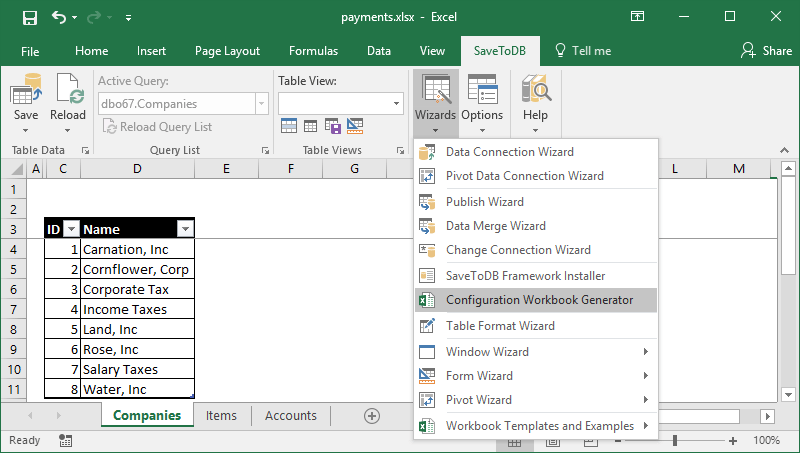 This e-book shows how to create Excel applications with the SaveToDB add-in and VBA. 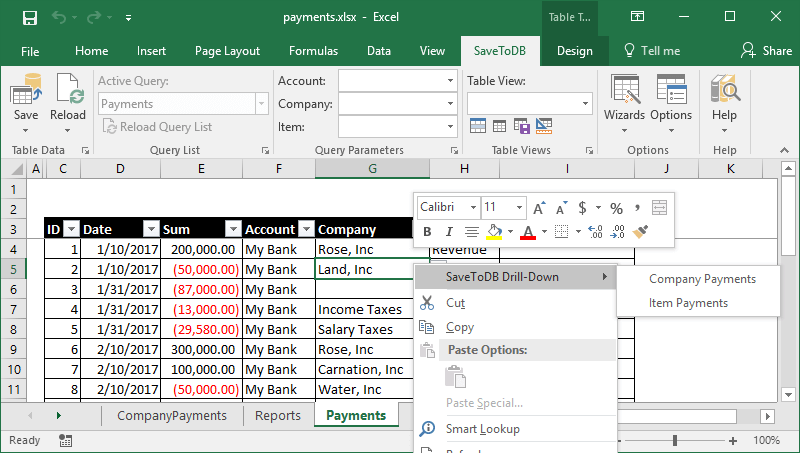 As a VBA developer, you may get great benefits and create larger applications in less time. 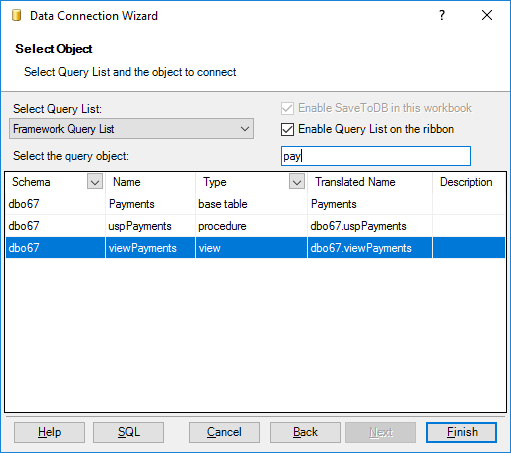 As a VBA developer, you may create applications using the SaveToDB add-in features or just use it as a library. 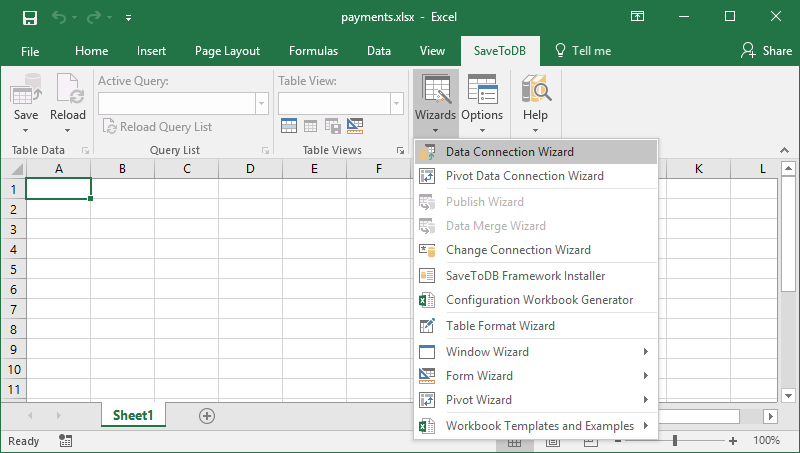 You get the fast and reliable platform that solves typical deployment and data layer tasks from-the-box. 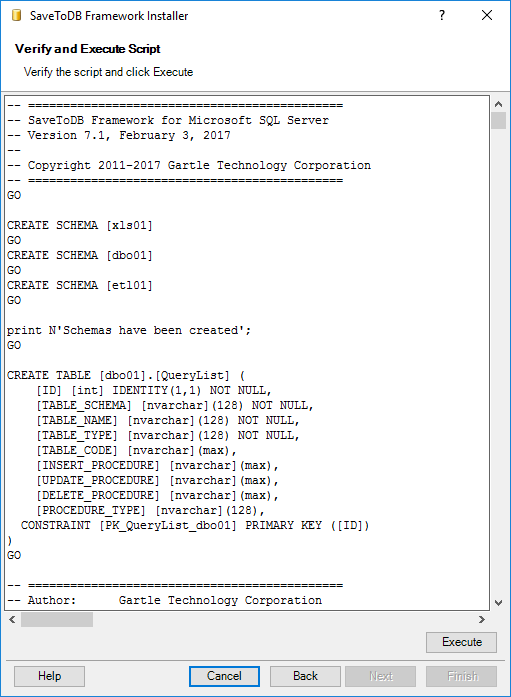 This book shows how to make these steps using the add-in wizards, SQL codes, and VBA macros. 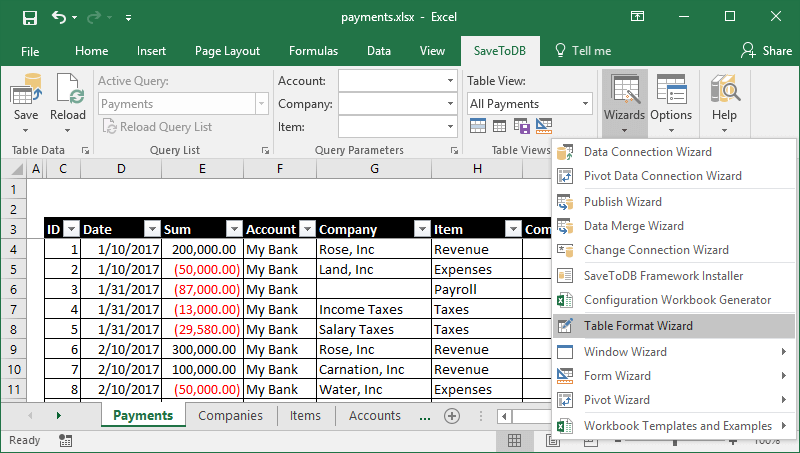 We start with a new Excel workbook and finish with a ready-to-use application. 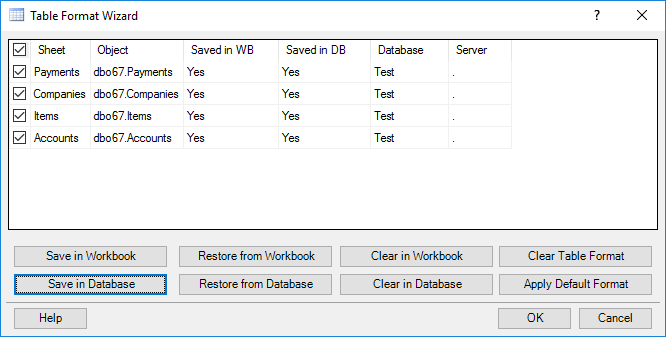 Every chapter shows standard SaveToDB features and configuration steps. 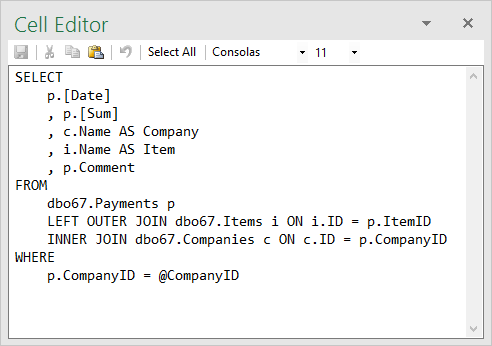 Also, it shows VBA codes that can use the described features. 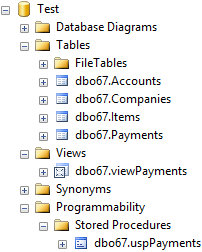 In the downloaded package, you may find a final application that contains complete source codes. 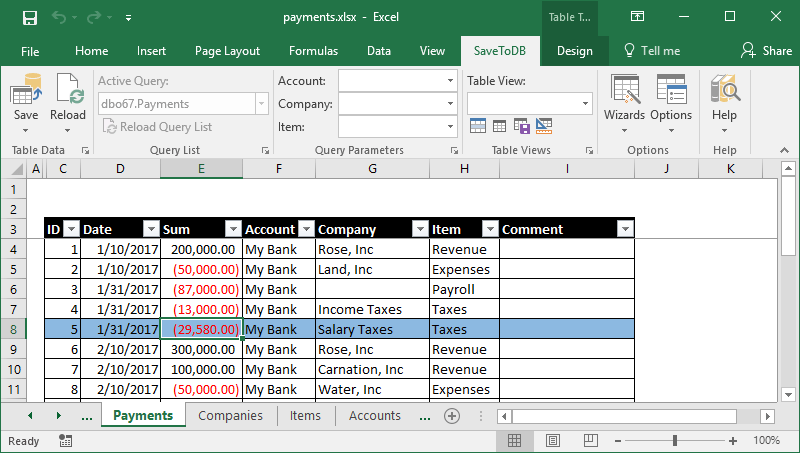 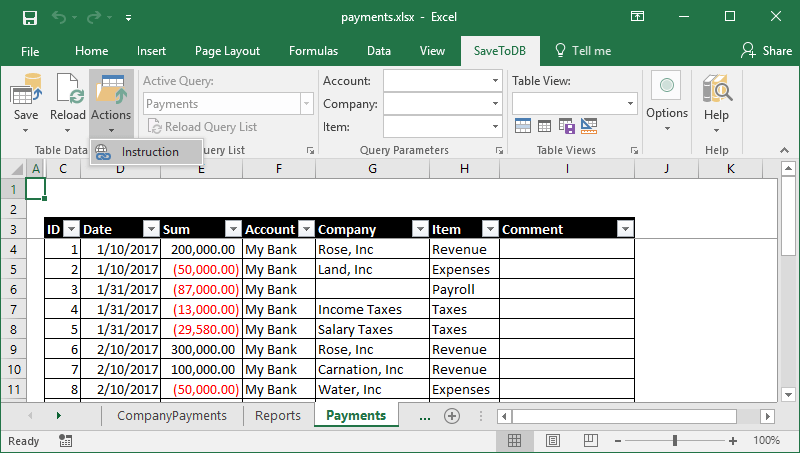 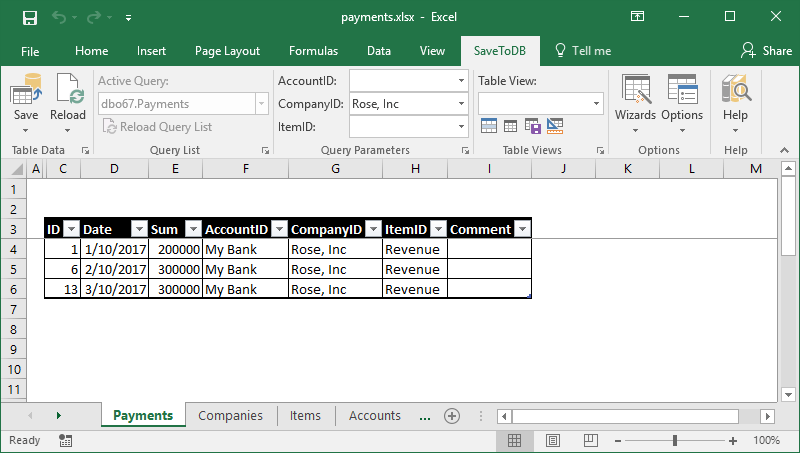 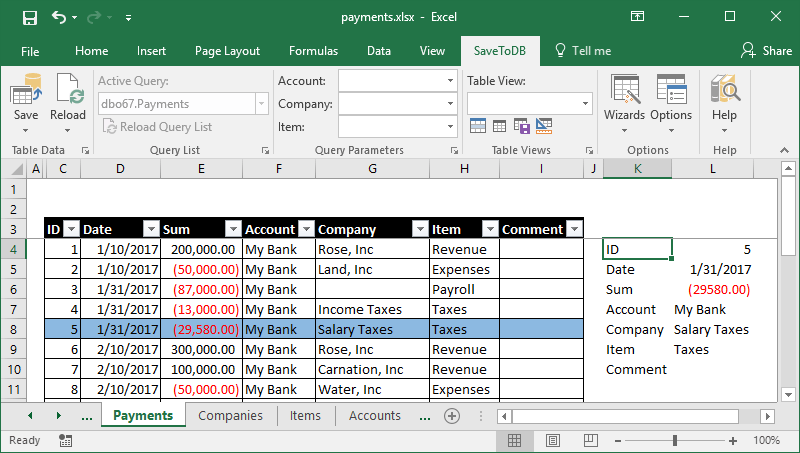 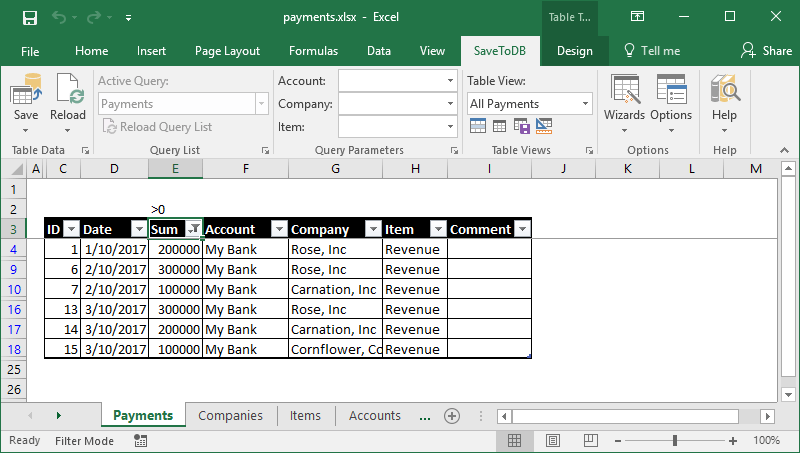 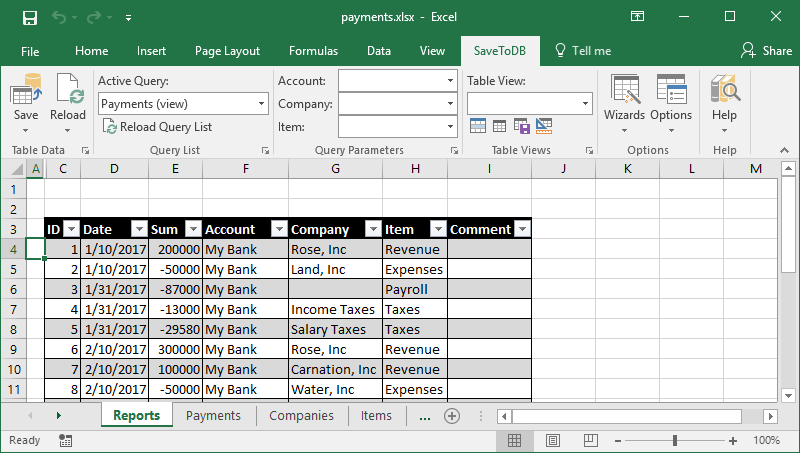 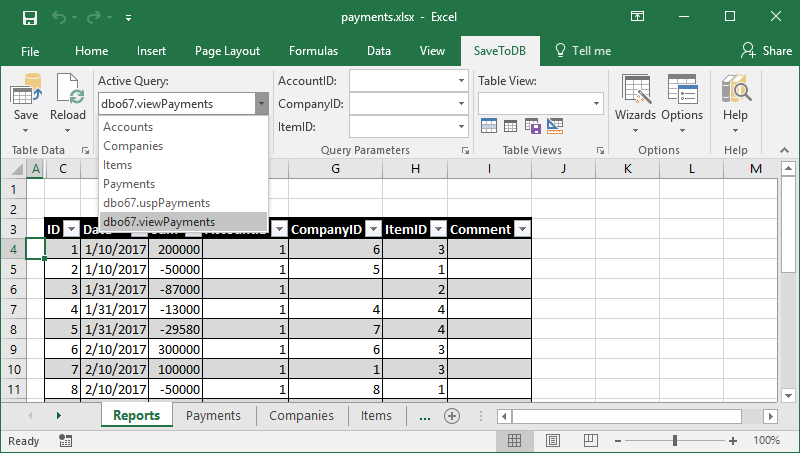 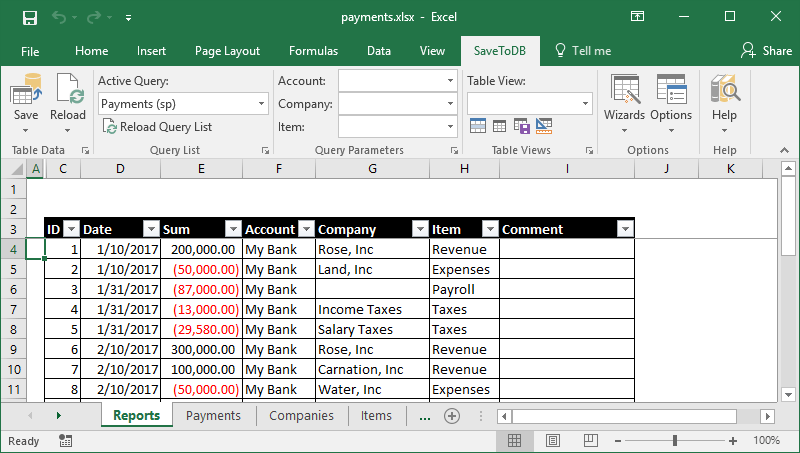 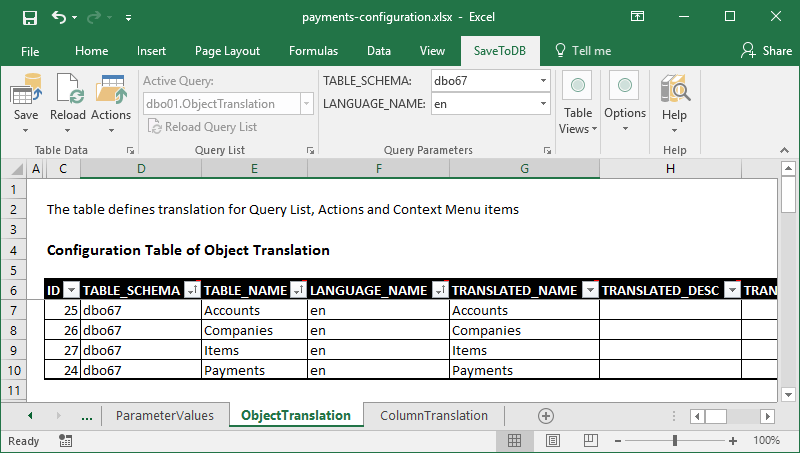 The payments.xlsm workbook contains a single worksheet and creates other sheets using VBA. 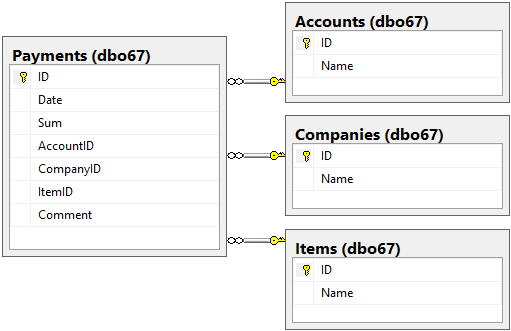 connString = "Provider=SQLOLEDB;Data Source=.\SQLEXPRESS;Initial Catalog=Test"
InsertConnectedListObject Nothing, Range("B3"), connString, "dbo67.Companies", "TABLE"
In the beginning, we get a SaveToDB add-in variable and then call its methods. 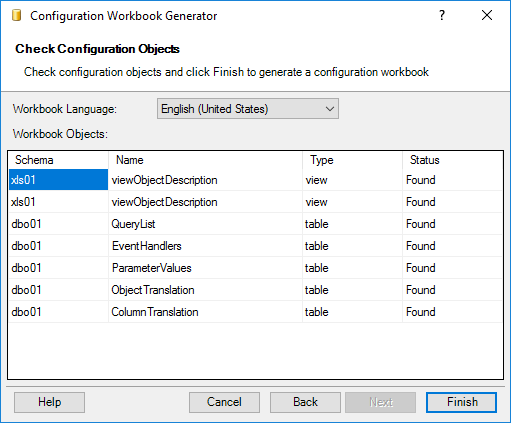 In the end, we get a variable for the created table and change the QueryLocked property. 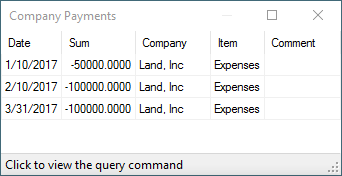 You may use it like Call GetAddIn().MethodName(parameters) or like GetAddIn().PropertyName = value. 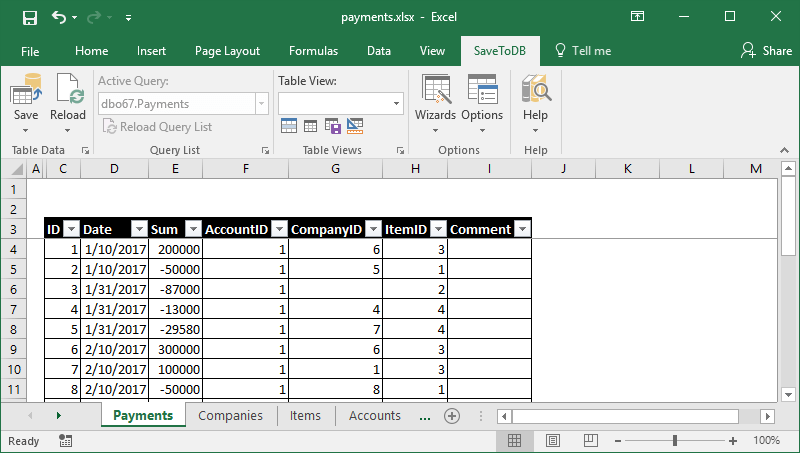 You may use the following macros on the buttons to save and load data of the active tables. 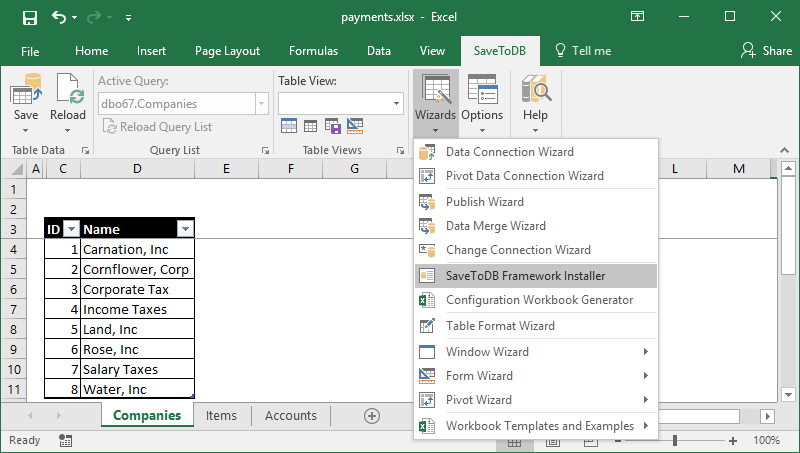 This method inserts hidden worksheets used by the SaveToDB add-in to make the tables editable. 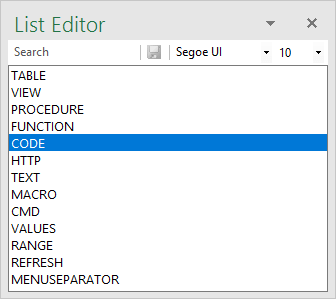 Debug.Print "Install the SaveToDB add-in"
& "You may download it at www.savetodb.com"
We have discussed the InsertConnectedListObject function above in this chapter. 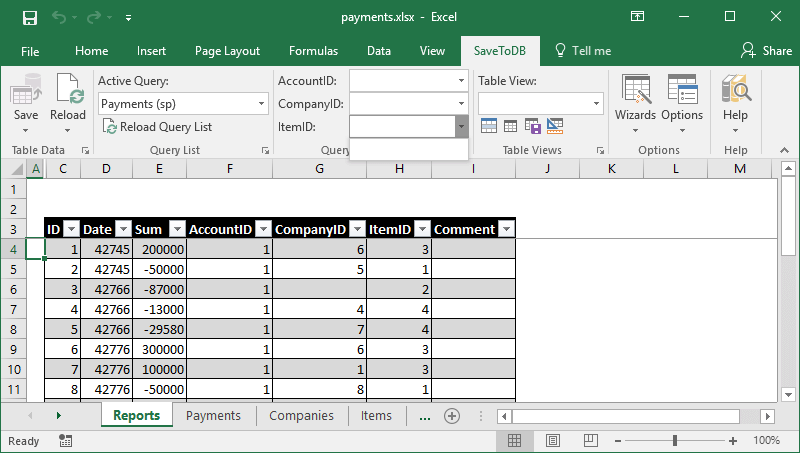 You may find and test a complete code in the payments.xlsm workbook. 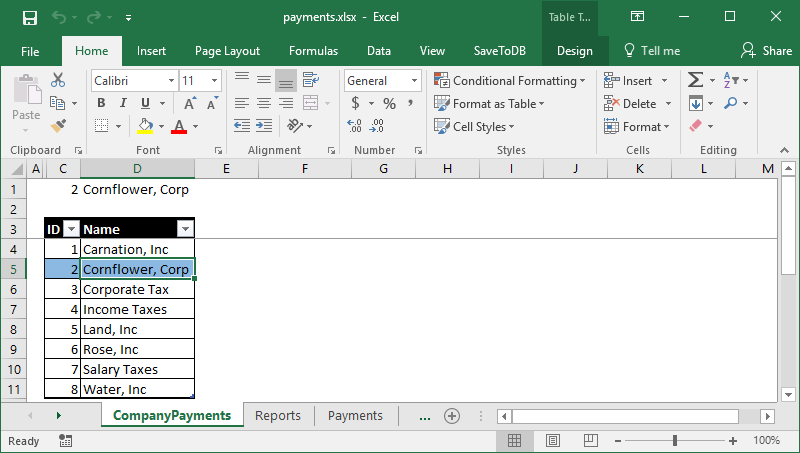 The code, used to create the payments table, is the same as described above. 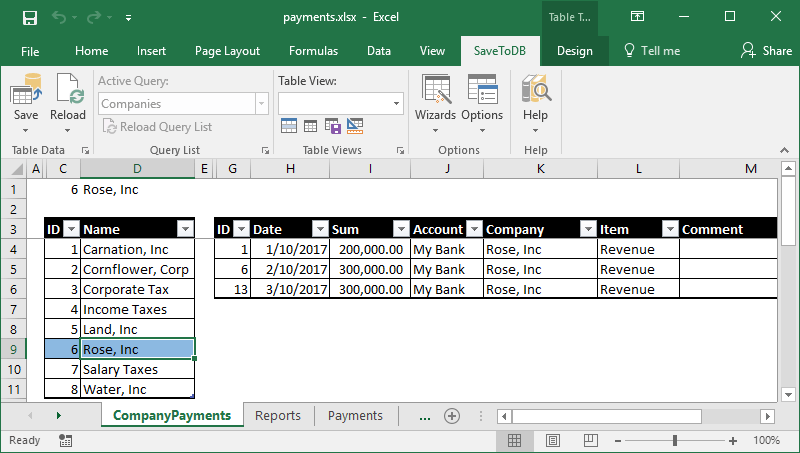 MsgBox "Worksheet Payments not exists"
MsgBox "Worksheet Payments does not contain a table"
Use the IsRibbonField property to add or remove ribbon fields of tables and views. Use the ParameterValue property to set field or stored procedure parameter values using values like ID. 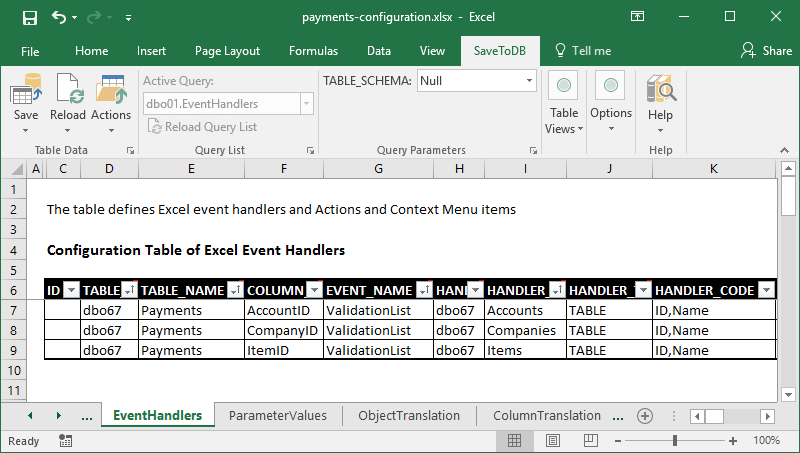 Use the ParameterRibbonValue property to set values translated by ValidationList handlers. 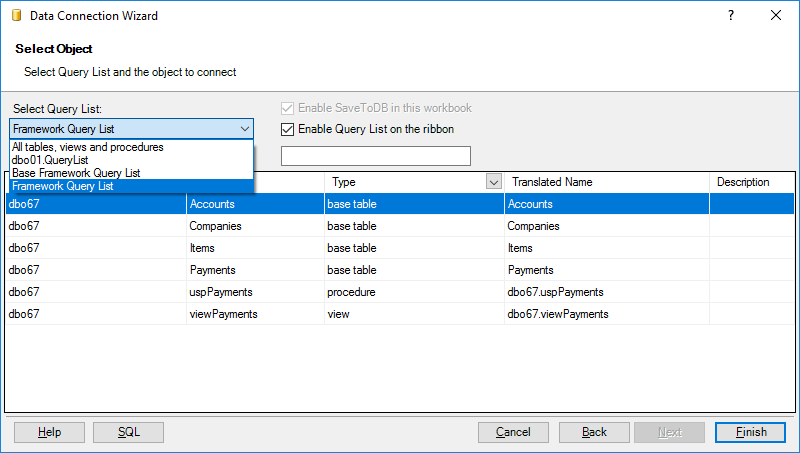 You may use the addIn.Options property to change other SaveToDB add-in options too. 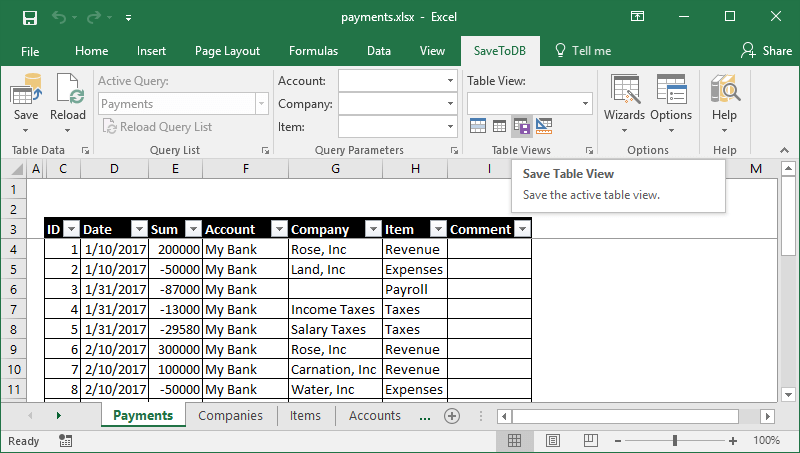 Mainly, you will use the SaveTableView and ApplyTableView methods. 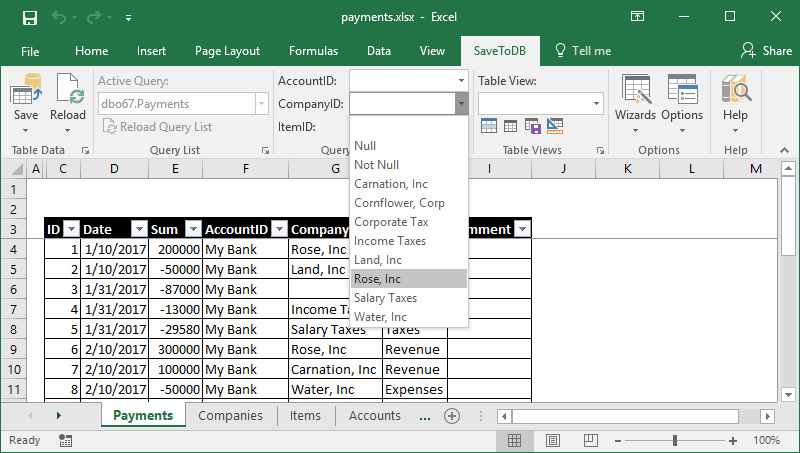 Also, you may use the auto-filter row over the tables to filter data in an easy way. 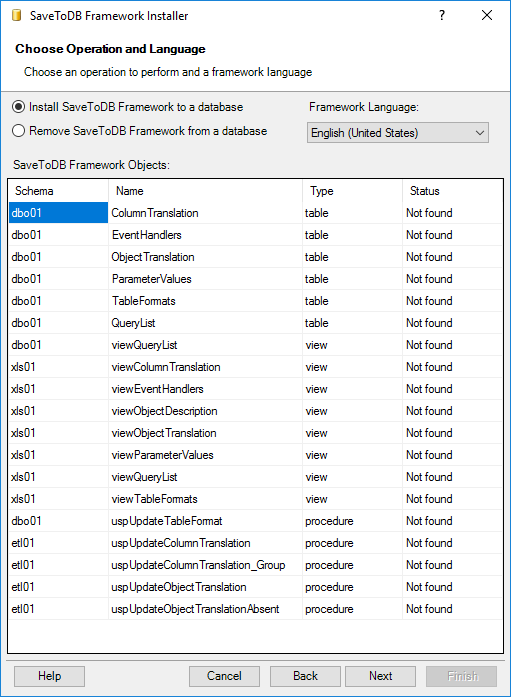 SaveToDB 7.2 has no methods to manage formats using VBA. 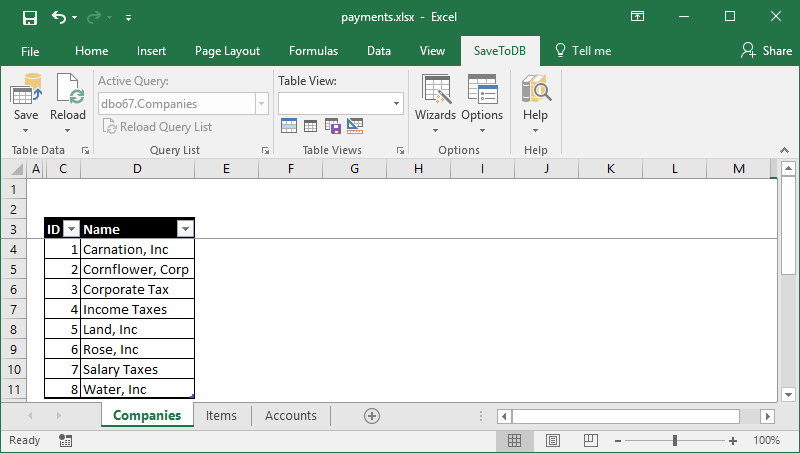 You may do this using the wizard only. 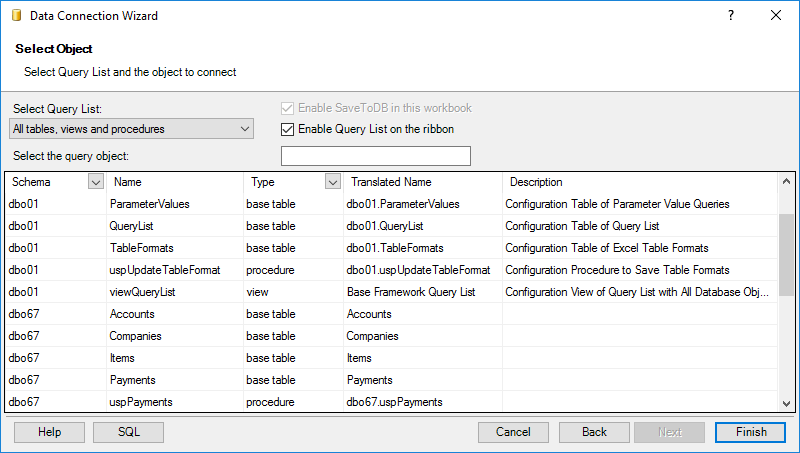 We have learned that the ribbon Query List allows changing query objects. 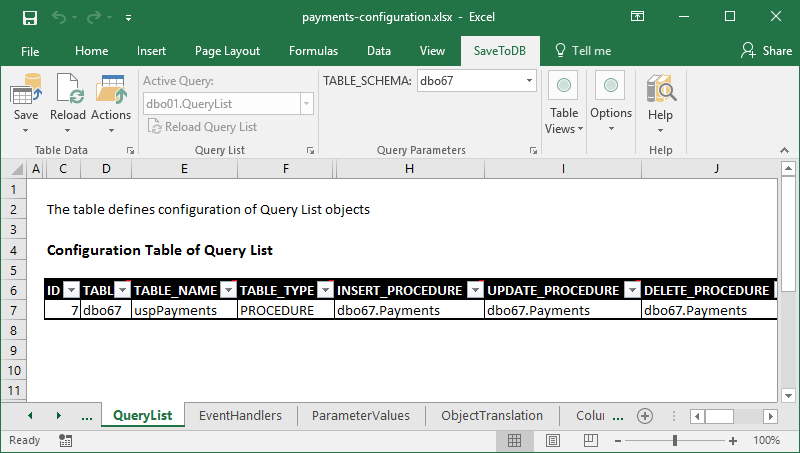 Be sure that the add-in loaded the query list configuration before. You may use the ReloadQueryList method to reload it. 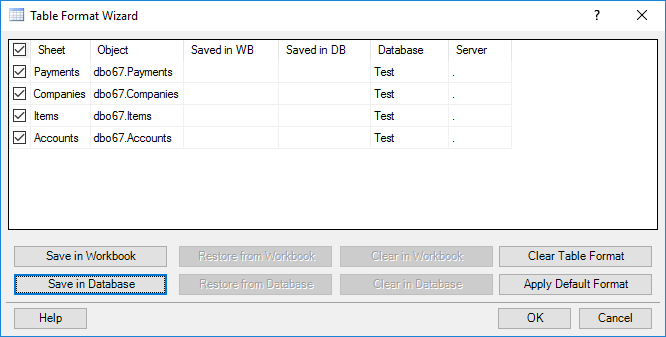 We have used the Save method to save data changes for tables in the previous chapters. 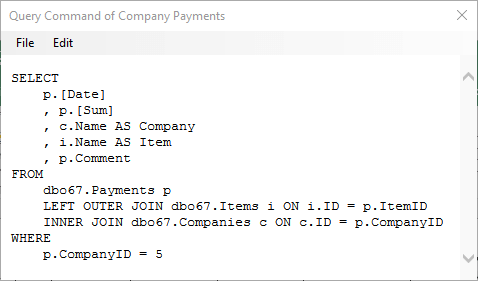 As a VBA developer, you do not care about the details. 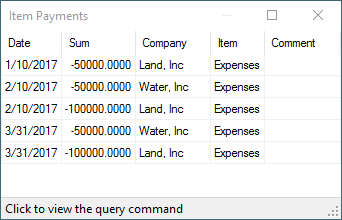 If the saving changes is configured in a database, you just call the Save method. 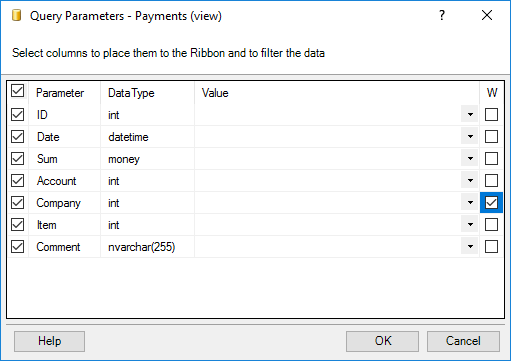 Below are the macros of the buttons. 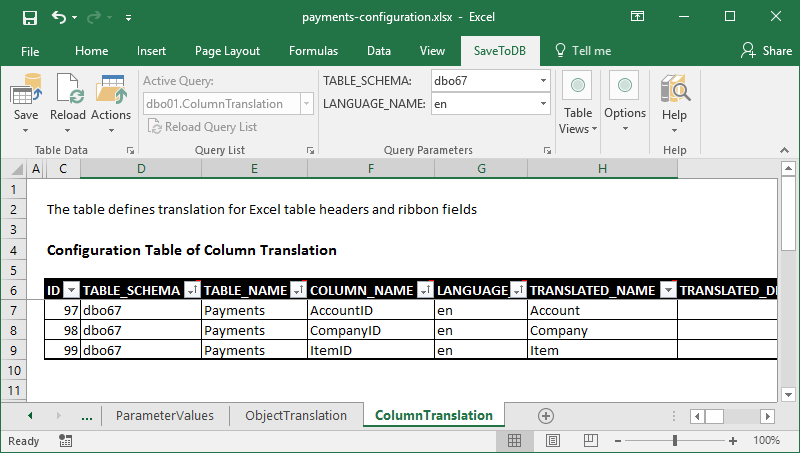 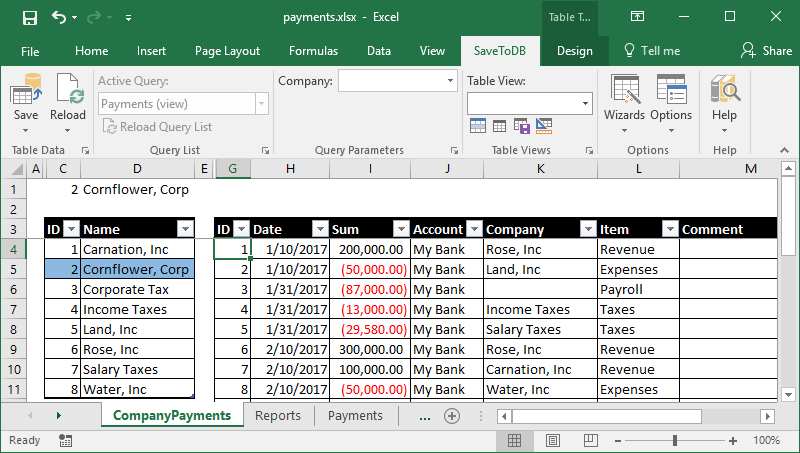 As the form fields are regular Excel cells with special names, you may also use Worksheet.Names.Add and Workbook.Names.Add VBA methods to create named cells with a worksheet or workbook scope. 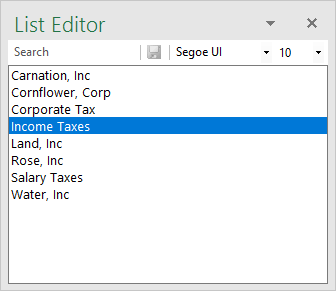 The SaveToDB add-in tracks ListObject name changes and changes the field names automatically. MsgBox "Worksheet CompanyPayments already has tables"
It creates a new worksheet and inserts two tables, dbo67.Payments and dbo67.viewPayments. 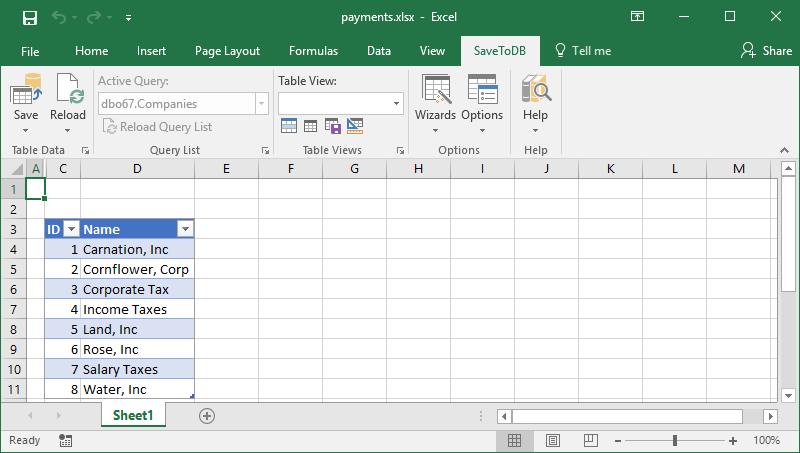 Then it adds a table cursor. 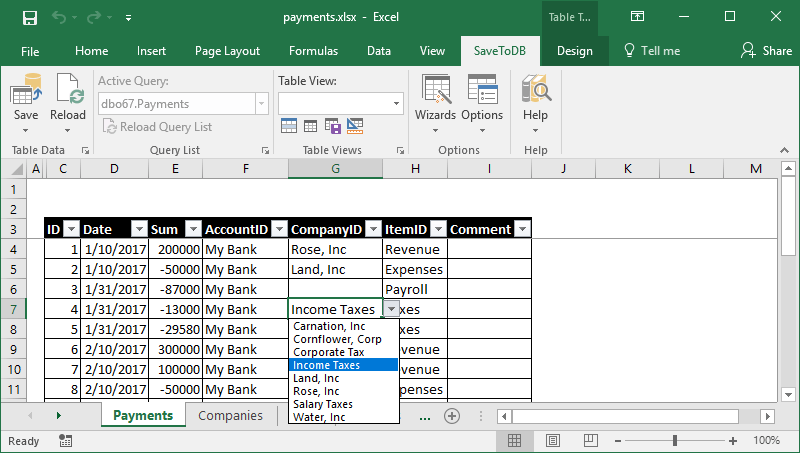 The code uses tricks to create the ID and Name form fields in the specified cells, C1 and D1. 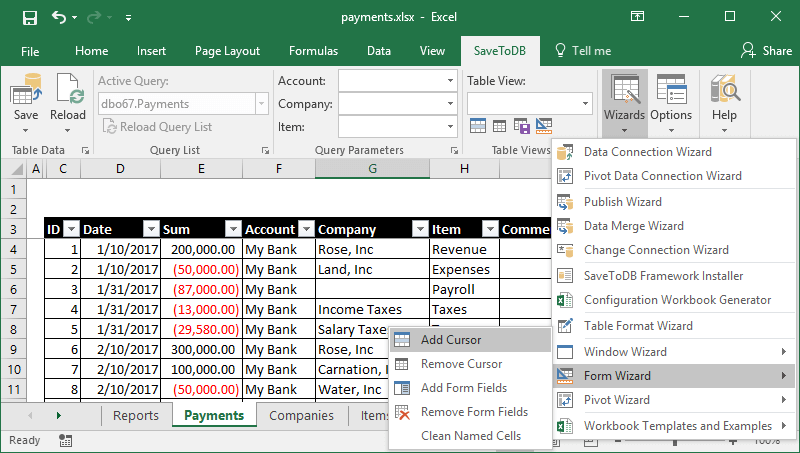 You may use the GetFormFieldCellName function to get form field names and the VBA Worksheet.Names.Add and Workbook.Names.Add methods to create form field cells. 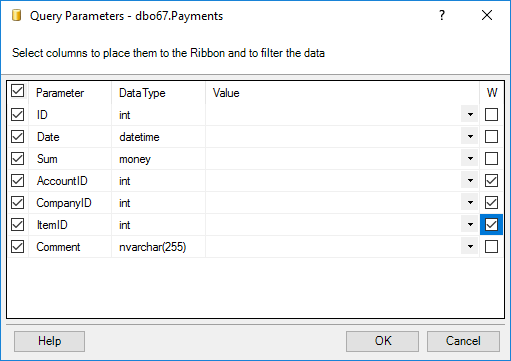 Then the code configures ribbon fields for the detail table. 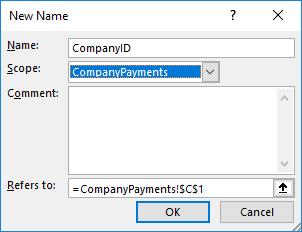 It leaves the CompanyID field only. Then the code creates the CompanyID name for the form field in cell C1. 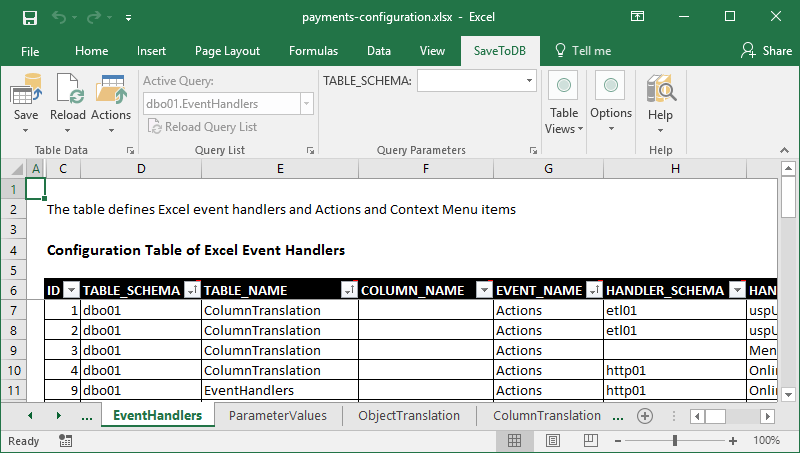 So, when a user changes a row in a parent table, the add-in updates the form fields, then updates parameters and reloads detail tables with new parameter values. 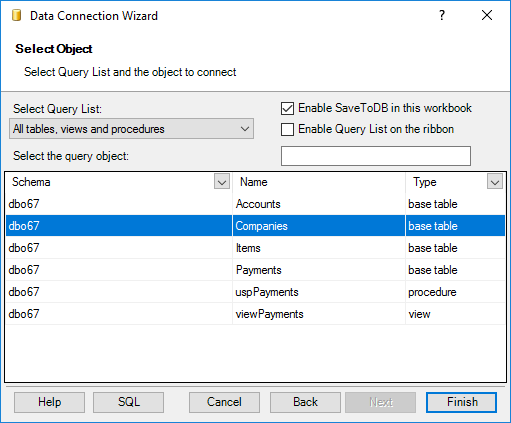 Using the add-in, you work with high-level methods while the add-in loads configurations from a database. 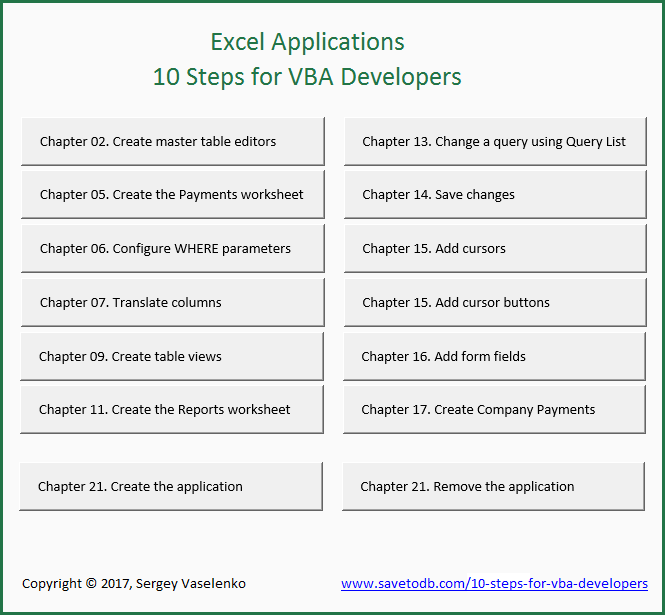 So, you may create applications completely using VBA from empty workbooks like in this book. 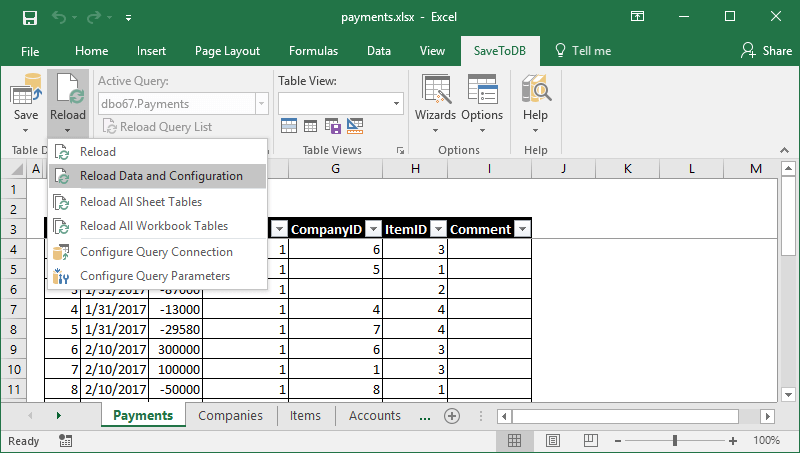 The most of the features are configured in a database, using configuration tables and SQL codes. 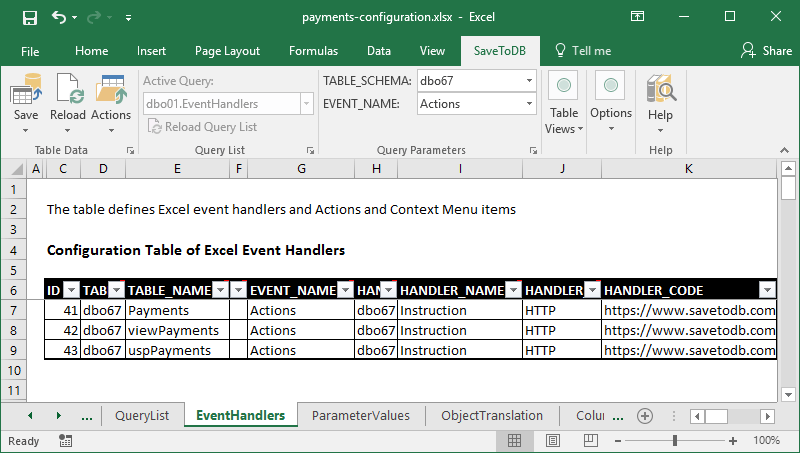 This is a big advantage as this solves all deployment challenges. 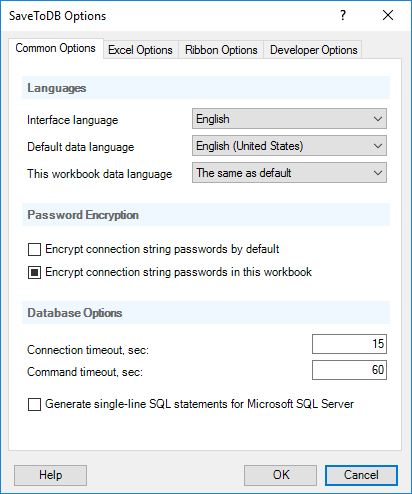 Users just reload the configuration. 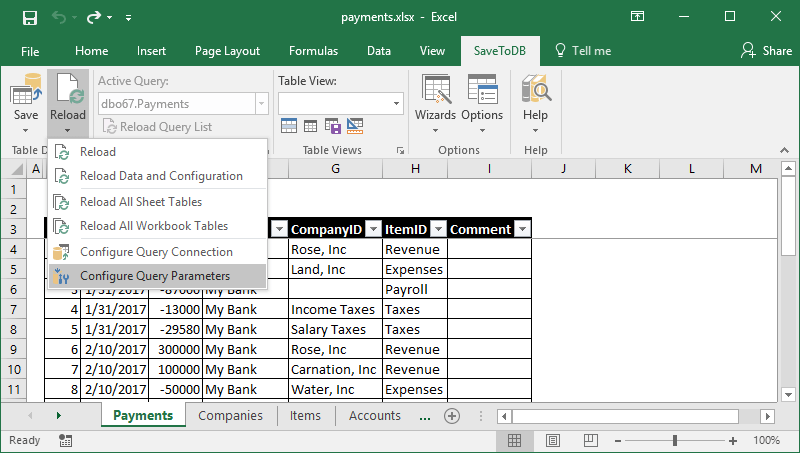 As a VBA developer, you may use these features from-the-box and add only specific features. 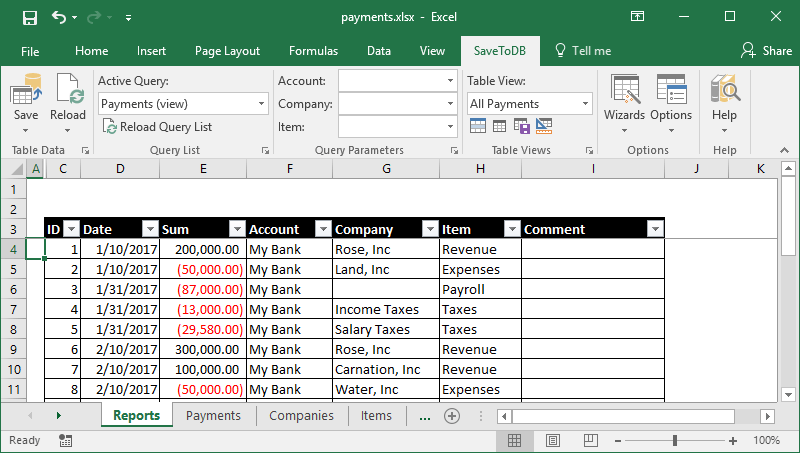 I hope it helps you build advanced applications with less time and efforts getting satisfied users and more money.